Powering nearly 70% of websites, PHP has emerged as the most preferred & widely used server-side language, which is the pertinent option for feature-rich website development! The millions of sites empowered by PHP are the testament to its growing popularity as well as user-friendliness. It has a massive impact on developing innovative websites and enhance their functionality. PHP web development enables you to attain ingenious website that helps your clientele identify your goods and services. We at PHP Development Services, develop sites considering the user’s perspective to offer complete satisfaction. Our competent team of web developers is capable enough to handle every project efficiently and deliver diverse services based on PHP web development to our valued clients across the globe. 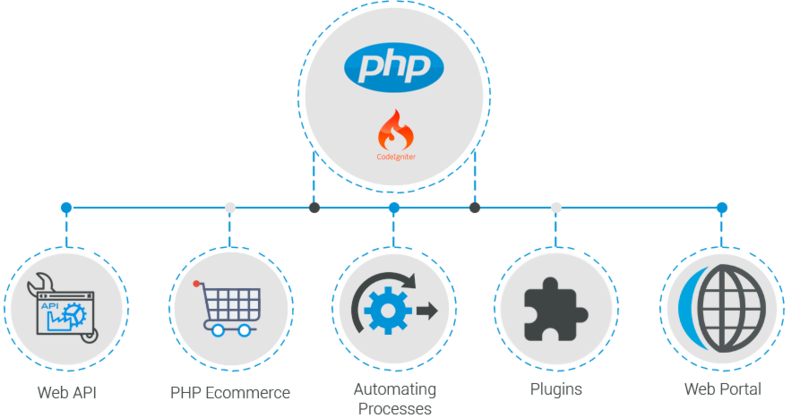 PHP Development Services is renowned as a leading & reliable PHP development company worldwide that offers state-of-the-art web development services across the globe. Our proficiency & strong expertise in PHP web development enable us to provide excellent services at competitive prices. We take pride in having the creative programming minds the rich experience of many years along with the most technically upgraded infrastructure to serve the diverse project needs of various industries. With considerable years of experience, we have accomplished thousands of projects by serving a huge client-base throughout the globe. Having in-depth understanding of MySQL, PHP, LINUX & Apache, our experts deliver word-class PHP based solutions, ensuring maximum complacency for our customers. We help our customers to get the maximum benefits of PHP. For this,our proficient developers ensure faster data processing as well as compatibility with various operating system. Our developers use 100% tableless layout that improves flexibility in modern web deigning and allows them to write codes that are standard compliant, well structured and loads quickly. Our ardent programmers make efficient use of this HTML-embedded language to create innovative sites and web applications with optimal performance and visual appeal.